Wholesale - Matey's American Pizza Co.
Gourmet frozen pizza is one of the hottest add-on profit makers for distributors and stores. Beer, pizza and snacks go together perfectly, adding gourmet pizza sales is an impulse buy item for your store. The price point and easy to grab package makes selling our pizza a profit powerhouse. We provide you with a freezer and delivery and even stock the freezer for you. 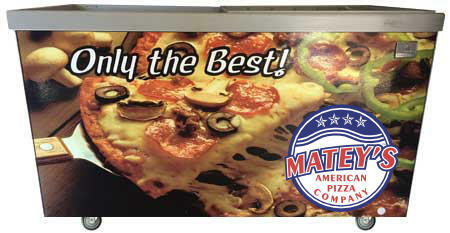 Matey's Pizza is by far our best selling frozen pizza we carry! Matey's being a local company, people appreciate the quality, taste, and consistency of the product they provide. The sales they run in store with us really works well for both Matey's and Valley Farm Market. Matey's is a welcome addition to our store! Pizza and beer go hand-in-hand! The combination works very well for both of us, customers enjoy the convenience of being able to grab them with their beer purchase, making it a one stop shop. The attractive freezers they provide at no cost to us is a great way to showcase their product. Are you interested? Get started!